Having a learning ecosystem that supports digital learning experiences connected to KPIs to show effectiveness and impact is important. 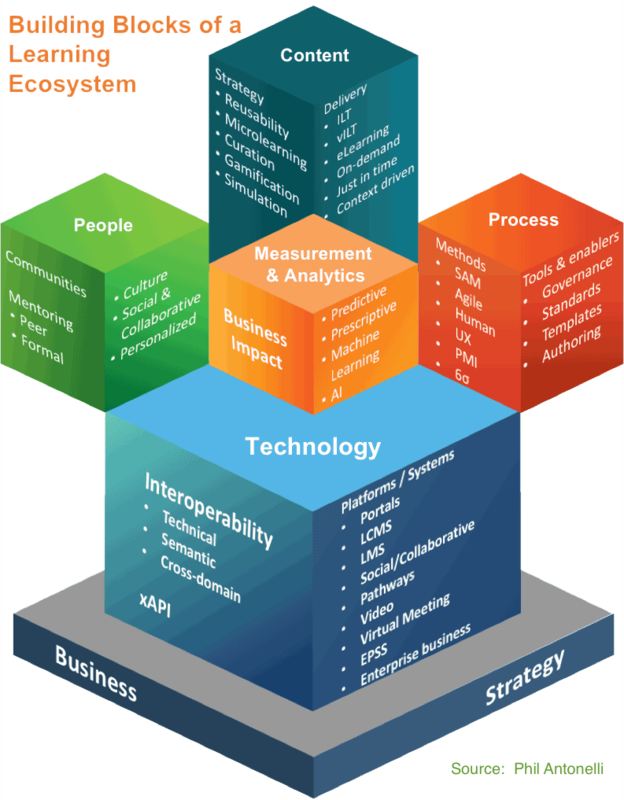 Developing a robust learning ecosystem has proven to create significant competitive advantages for many organizations; however, it should be noted that building an effective ecosystem is likely to be complex undertaking as shown in the diagram (right). Design Thinking is a set of tools and methods used by designers to solve complex problems and find desirable solutions. Design thinking in business uses the designer's sensibility and methods to match people's needs with what is technologically feasible and what a viable business strategy can convert into customer value and market opportunity [Tim Brown. Design Thinking. Harvard Business Review, June 2008]. One popular tool used for design is called the Business Model Canvas (BMC) -- a 1 page tool for understanding, designing and evolving a business model. We’ve been using the BMC model for products and service design with great results and saw a possibility to leverage its utility for learning ecosystem design. Value Proposition – what value are you delivering to your users? Learning Relationships – what relationship will users have with the ecosystem? Learner Segments – what are types of learners and journeys in the ecosystem? Channels – what are the ways that learners will be reached? Value Metrics – how do you know that you are delivering value? 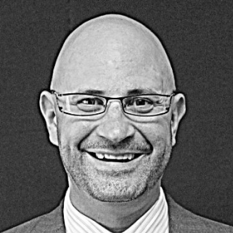 Partners – who are the partners you need to deliver the value? Activities – what activities must be taken to build the ecosystem? Resources – what resources are available and needed to deliver the value proposition? Investment Drivers – what investments are needed to enable the ecosystem? The goal is to create a visual framework and set of elicitation questions, which puts a “lasso” around the complexity of your world. It’s can be used stand alone or in conjunction with other Design Thinking tools to capture data about the current and desired future state of a Learning Ecosystem. A few years ago, I was collaborating with John Delano (CEO and Founder of Saltbox/WaxLRS) on some business model innovation and I shared the BMC with him. We used that to better understand how the Learning Record Store (LRS) business model might be innovated. We discussed how the canvas was useful and might be helpful for modeling learning. John further built out the Learning Model Canvas. Over the last few years, we’ve been experimenting with different Design Thinking Tools to elicit ecosystem designs and tried different variations of the elements and elicitation question framework. 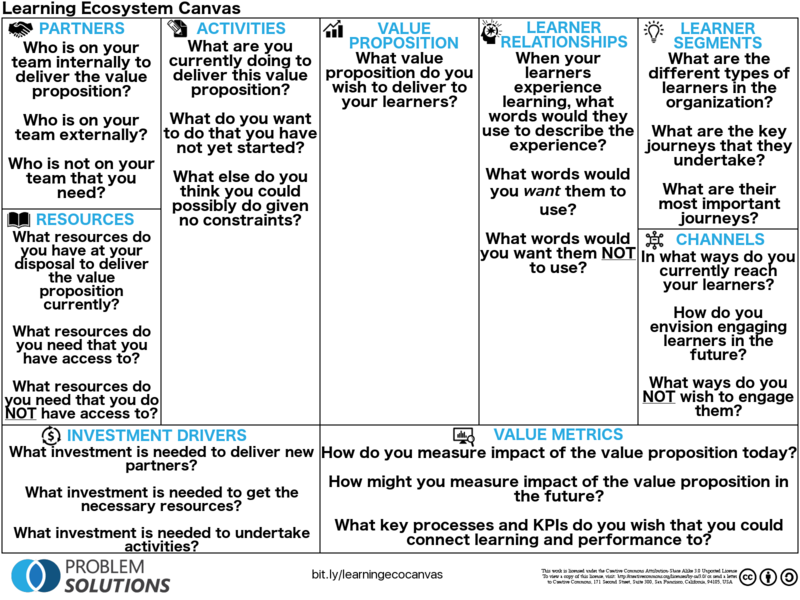 The first time I used the learning ecosystem canvas, I had a loose set of questions to drive the data collection. I’ve experimented over time to determine the smallest set of questions that helps to elicit information accurately and quickly in the canvas. These early captures were still incredibly valuable, but could have been accomplished much more efficiently. Using the canvas questions today, it is possible to take a team of 4 or 5 people and virtually capture a large amount of context and establish priority areas for value creation in just a few hours. Quick Capture: A small group of people (2 to 4) from an organization sit down for 45 minutes to 1 hour and brainstorm all elements of canvas. This base capture is then used to explore deeper levels and validate assumptions. Preferably done face-to-face, this session type can also be hosted virtually. Structured Capture: As the learning ecosystem is a complex model, a diverse group of stakeholders should ideally be at the table (and in the same room). Included in the team should be members from L&D, HR, and IT. A large organizational cross-section should provide data and vision for a holistic approach to mapping the current and future state of a learning ecosystem. In this type of capture the team is timeboxed to a 4 to 8 hour session, and ideally incorporate other Design Thinking tools (like the Employee Experience Canvas). This type of capture approach yields the most momentum for ecosystem design as it builds shared vision and support. One of my favorite aha moments with the BMC is based upon a visual risk assessment variation that Tim Fletcher does with the BMC. He takes BMC data that have been captured and identifies completion, control, and risk using some simple but powerful techniques. The power of the BMC and Learning Ecosystem Canvas is that they both collect large amounts of information very quickly, but that has a double edge. Understanding and sorting this information into an actionable plan is key to strategy and project success. We use a similar technique with the Learning Ecosystem Canvas to manage risk. This allows risk and control to be identified as a follow on activity to an initial data capture with the Learning Ecosystem Canvas. 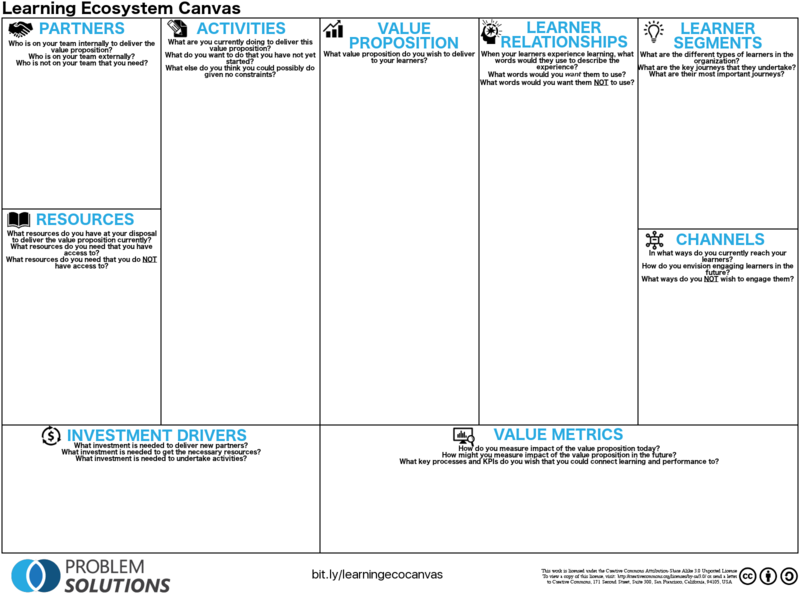 The Learning Ecosystem canvas is a great co-creation tool. This tool enables a common context to form between our team and our customer team around value creation and bid ideas. At the same-time it allows for priorities and focus to emerge. Organizations really buy-in to supporting an ecosystem approach if early projects quickly add value and prove wins along a path to something very robust. The canvas allows teams (internal and external) to work together to define a common purpose and work towards that purpose. For teams that are doing initial captures, I recommend having 1 on 1 conversations with peers as a first step after capturing your initial view of the ecosystem. I like to start those with “We’ve been thinking about our learning ecosystem and are trying to see where we might move the needle. We’ve captured some data, and I’d love if you could take a look at this and provide constructive feedback, ideas, or even tell me what we’ve missed!”. This is a simple way to collect more data and validate assumptions and each team member from capture team can divide and conquer pretty quickly. Once an iteration is done, then share a validated model up the chain through management (especially outside of L&D). Keep your focus on creating shared vision. The canvas is living model. It starts with your current world and adds the dream state. There are multiple ways to visually organize this and keep the canvas as a capture, planning and vision tool simultaneously. The canvas should be on your wall, in a “war room”, where you can continually capture and play strategy games. It should also live in a digital form, so you can communicate with stakeholders in a common format. We’ve built this canvas to help take organizational thinking and design abilities to a level that can build the robust learning ecosystems we’ve all dreamt about. It’s our hope that these robust learning ecosystems will help companies build learning journeys with value that produce employee delight, business outcomes, and competitive advantage through data-driven people development. This is just one of a number of Design Thinking tools that can aid in resolving complexity and clarifying fuzzy spaces that are prevalent between doing and training. 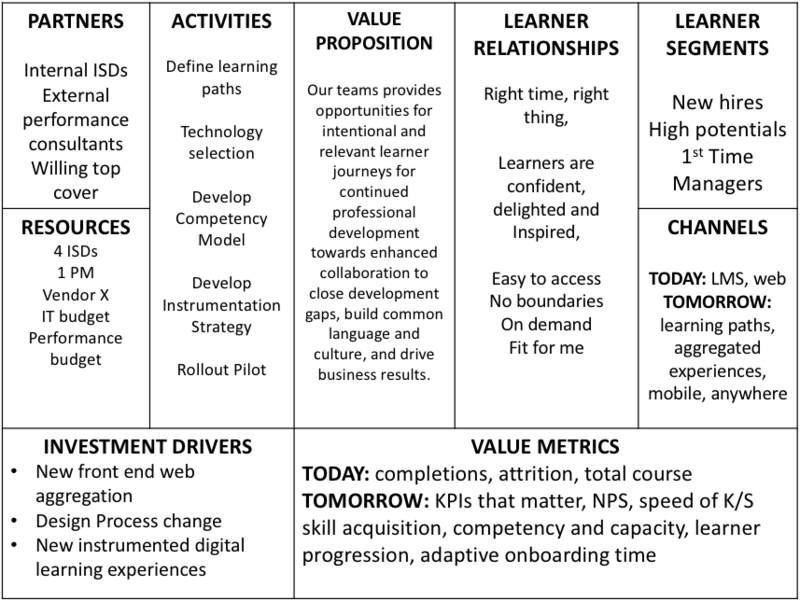 There is a lot of work to do to build a robust learning ecosystem with digital learning experience connected to KPIS, but this tool should be a great momentum builder.